Scotch-Irish fire sparks from my mother’s eyes when she laments the damage done her children when she and my father divorced. 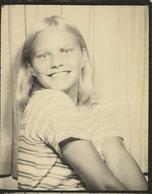 I was eleven, my sister six, and my brother, who stayed behind with my father, was 12. Our family was rent. "You kids were like seedlings that I ripped from the ground," my mother still says four decades later. She grabs the air with arthritic fingers as though holding the rootless sorrows of her children’s lives. Her memories haunt her: ghosts of guilt over what she sees as her failure to thrive in a difficult marriage -- one doomed only by ordinary troubles. Love is difficult, I tell her. I am as old as her mother was then. There are no easy answers; there is no going back; I forgive you. Her gesture remains between us, higher than our heads. "Ripped - from - the - ground." The story told again, she drops her hand and rests it between us. We sit at her flawless dining room table. She bought it with her inheritance from my grandmother. She wants to know my sister and I will be left with something beautiful that connects us to our family tree. Her hands—small, strong, utilitarian— are restless on the fine wood; skim the graceful oval tabletop. She worries a tea towel’s embroidered edges. Her skin is translucent porcelain chapped dry from a lifetime of cleaning and fixing: use it up, wear it out, make it do or do without. I stretch my hands toward hers. My right index finger knuckle is swollen and red, and its middle finger neighbor is becoming unreliable with its willful tricking and popping. My digits are gnarling into my mother’s hands; hers, into my grandmother’s, as though for generations we have washed the same dishes, scrubbed the same collars, soothed the same children’s brows, waxed the same floors, repaired the same sticks of furniture, and tended the same garden. As though we mend the same tatters to the same end: to make something useful – even handsome – using history’s thread and a needle passed like a scepter from one life to the next. As though by our hands and skin and blue-gray eyes, we embody a single story even as we cocoon the lives we carry within our DNA. 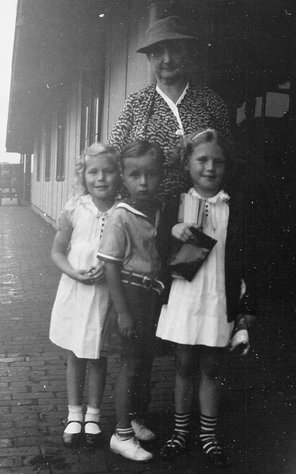 My mother, sister and I left my father's house six weeks after Christmas. I took everything I owned — a few treasured books, and beloved gifts my father's parents had given me over the years: a Dutch pencil box with a miniature abacus under the lid, a Japanese doll wearing a luxurious red brocade kimono, and a marionette, a kilted Scotsman who carried a green bottle and walked drunkenly, pulled by strings my unskilled hands could not master. I took my clothing — the blue tartan kilt that matched my sister's, white and navy blue knee socks, and mittens knitted by my mother’s mother. I carefully packed the new guitar my parents had splurged on at Christmas, as though I could pluck sustenance from its strings to sustain me in the months to come. My sister took her new Show 'n Tell record player. My mother took bare necessities for my sister and me, and those things that she had come with to her marriage sixteen years earlier. She reclaimed from me the passed-down Jenny Lind bed, matching dresser and night table with the pedestal hand-lathed from a cast-off textile mill shuttle loom. She took her great-grandfather Bailey's bentwood rocker and his wife's fragile cane-bottom dining chairs; the chest of drawers we called Little William after a long-gone uncle or cousin. My mother and I pushed it into its place by the apartment's front door where it would hold scarves and hats. She took the quilts that had been made and passed down through her family like tangible, colorful histories; and her shoebox photos, populated by country people standing at attention in tiered generations of high cheekbones, grey eyes, and English skin worn to wrinkles as their decades passed in front of the camera's cocksure eye. Because only my mother and I truly played it, she took the spinet piano. Its bench had a plump needlepoint cushion with a gold background and black stitches patterned into a treble clef and the first few notes of a hymn, its title unremembered now. Our living room furniture consisted of Grandpa Bailey’s rocker, Little William, a lovely (if impractical) tea cart my grandmother presented to my mother during some low point of her life as a young mother, and an oversized blue buffet in which my mother stored sewing supplies. Cached there were department store boxes filled with yards of fabric bought and never used: woolens, calicos, and tweeds. Shoeboxes held pins, needles, spools of thread, and the sharp silver scissors my mother forbade us to use on anything but fabric. Paper bags overflowed with remnants so small they might appear useless — scraps, really, mostly from my mother's projects, some from mine, each leftover neatly rolled and tied against someday. The sewing machine, after the piano, was arguably her most valuable possession. It had been a wedding gift from my father's parents. To my knowledge, it was the only thing that remained of that intractable relationship. We drove away from my father's old white clapboard house in the Buick he had given my mother years earlier. My sister sat in back tucked between dresses and coats hung on a bar suspended between car doors. I claimed the front seat, oddly unchallenged, and pressed my forehead onto the cold window, fighting indignant tears as we rolled down Superior Street to the stop sign at Iron Avenue. Three blocks down, to the right, our new apartment waited to tide us over until the end of the school year when my mother would find a new teaching assignment in another town. Why are distances of the heart never proportional to miles traveled? We covered light years in that first half-mile separation. I hated our new apartment. My twin-size mattress on its Hollywood frame was cramped compared to the high, full Jenny Lind with its spindles on which I had learned to park my gum at night. I hated sharing a room with my kindergartner sister. I hated the neighborhood. I hated my mother for what I believed she had done. She had been drowning under the weight of her life – my father's ministry, my brother's wildness, her trampled sense of self – but I could not know this and so failed to understand the depth of her will to survive or the devil’s choice with which she had been faced. I only saw that when she left my father, she had ripped the timeline of my life in two, leaving my father and before on one side, ragged and irreconcilable with what was already, in my mind, the ever after. Mostly, though, I hated how I had been sent tumbling through an unraveling universe that seemed utterly unaware of me. When traffic cleared, my mother turned from Superior toward our new apartment. Poplar sand maples arched winter-bare branches like a filigreed tunnel over Iron Avenue as it ran west along the rim of the Tuscarawas River bluff, parallel to the railroad and river below. Our new apartment lay uphill where the steep road leveled out and diverged from the tracks and water. The Avenue was lined with well-kept, if fading, 19th-century homes built for the town's former steel and coal barons. The broad-lawned mansions backed up to the edge of the bluff – their back windows looked over the river valley and toward the hills to the south. The aging steel mill’s chimney rose from the shuttered factory below, where it had once bustled with rail and barge traffic landing iron ore and coal and loading finished steel. Every house seemed abandoned that afternoon. Patches of sooty snow lay here and there on the manicured grass. The largest mansion – it had a caretaker's cottage close to the avenue – was known to be haunted. My brother and I had once sneaked up to its bare windows and pressed our faces against the glass to peer inside. Sheets covered perfectly arranged furniture and we told each other there was probably treasure hidden in the house. I thought of this as we drove past and how he had kissed my cheek good-bye just minutes earlier. The duplex appeared like a 1960s afterthought at the end of the row of lifeless grand ladies. Here, just before Iron Avenue turned into a stretch of mid-century modern office buildings, the graceful tree arch had been razed to widen the road. A single young oak grew between the duplex and the avenue. My mother turned again and the car crunched to a halt in the gravel parking lot that led to our new back door. It was freezing inside. My mother borrowed the neighbor lady's phone and called the landlord to come light the pilot in the basement furnace. My sister sucked her thumb and stood wide-eyed, clinging to my mother's leg as the neighbor and I sized each other up. It anguishes me now to think of how frightened and desolate my mother also must have felt that day. How deep had her loneliness run that she would take us from the only life we had known in a manner that will seemingly haunt her until the day she dies and some higher power redeems her? Yet were not my anger and confusion also well founded? I took care of the things I could in the ways I knew how. I dusted and vacuumed, did laundry and dishes, and helped cook when my mother was elbows-deep in grading ninth-grade English compositions. I let my sister have the bed closest to the window. 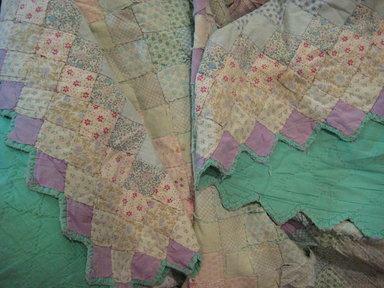 I made them up with the quilts we had known forever, the pink one on her bed and the green one on mine. Aunts or grandmothers had made all of our quilts. My mother's was the most intricate. Mine was older and bigger than my sister's, and therefore had many more squares on its face; hers was newer and brighter. Mine had covered on the larger Jenny Lind bed amply; now I had to fold it in half so it wouldn’t drag on the floor from my new, smaller twin bed. I arranged it carefully so its pattern fell evenly from the middle of the mattress. I knew my quilt – its colors and stitches –like the veins on the back of my hand. It carried stories in its two-inch patches seamed together with fine white stitches: there was an uncle’s old work shirt, and there was a bride’s honeymoon traveling suit, and there was a cousin’s Easter dress calico. The story of who I was and had come to be seemed carefully, painstakingly, written in the quilt's language of remnant and thread. Sometimes I folded the quilt into a fat cushion on which I sat practicing my new guitar, learning the chords to the songs that I had been taught – ballads, hymns, folk songs, and my father's go-to car song, “Where the Rhododendrons Grow." Other times I fled the tiny apartment and found my way to the bluff beyond our back door. I discovered I could slide loose-limbed down its face, using exposed roots for handholds as I worked my way to the floodplain’s railroad and river. Coal trains still ran through town regularly and cast-off lumps like immature diamonds could be found along the cinder right-of-way. I picked them up from between the creosoted ties and flung them high and hard toward the muscled river alongside. As I walked away from town, the bluffs softened into wooded hills. I could not get lost; no matter how far I ventured the river and tracks would lead back to home. Only once did I leave this sure path. That day I walked too far and, when rain threatened, I tried to take a shortcut through the woods to avoid having to double back, and then climb the exposed bluff’s steep slope. I had seen a trail leading uphill through the woods. I followed it until I reached a plowed ridge and suddenly wide, open (if stormy) sky. I hiked up the meadow as the sky grew darker. When I reached the hilltop I had a long view of the valley and the far-off town. In a disappointed instant, I realized that my best course lay behind me; back to the river that I knew would lead me home. I turned and walked quickly and then, panicked as darkness began to gather, ran as though a banshee chased me, down the sloping field, into the woods and along the uneven path crisscrossed with exposed roots that had been teased from the ground by erosion during the previous summer's floods. I slowed and caught my breath. After I reached the tracks I ran again until breathless, as though whatever I had seen at the top of the hill threatened to trip me, pin me down, and hold me until I perished in the cold rain that had begun falling. It was pitch dark by the time I scrambled up the bluff behind the apartment, grasping fists of cold, wet roots for handholds as I climbed. When I burst through the back door, my mother looked up from the kitchen sink. Where had I been? she wanted to know. Why was I out of breath? Was I all right? I pushed the door closed and looked at her – really looked at her – as she made dinner by the apartment's bright and unfamiliar fluorescent lights. When I didn't answer, she paused then fully returned my gaze. What's wrong? she said slowly, as though truly seeing me for the first time. The water washed over her hands; one held a paring knife and the other a small hothouse tomato. I knew she would cut it carefully into six equal pieces – two for each of us. The moment expanded beyond its seconds and filled with the humming overhead lights, the rushing faucet water, and the sizzle of hamburgers. Steam rose from the skillet where four quarter-pound patties fried in 1 teaspoon each of Worcestershire sauce and butter, a recipe she had cut from the Reader's Digest – one-and-one-third burgers apiece. In my memory I see my anger emanating like knives from my injured heart, and my mother's undefended love taking them in like a river oyster enfolds razor-sharp grains of sand that in time it will lacquer into pearls. I refused this forgiveness. "What's for dessert?" I sulked, knowing there was no money for weeknight treats. Her face fell. I marched on through the kitchen and up the wooden stairs to the bedroom. "Honey," I heard her say behind me. But I had already stopped listening. "Certainly the quilt was made by a woman who knew better than to waste any small thing that came her way: a scrap of fabric, an opportunity, a precious life." Upstairs, I pulled the curtains to block the streetlights and headlamps cast by cars traveling down Iron Avenue. I spread my quilt on the linoleum, rolled myself tightly within it, and wormed my way across the floor and onto my bed. I pulled my head into the cocoon and breathed in its warmth. I did not think that night about the woman who had made it or about those to whom it had been passed from generation to generation, woman to girl. Now I wonder who created its pattern. Was it my great-great grandmother who came from Ireland to work in other women’s finer houses? My great-grandmother who once placed her four-feet ten-inch frame between her drunken son – and the gun he brandished – and her granddaughters whom he threatened to kidnap over her dead body? Or was it my grandmother, who once had nothing to offer well-heeled visitors but a glass of water – even the last teabag had been reused too many times – something she did proudly, she often said, generous in what she had instead of ashamed of what she did not. Her cousin, my Auntie Thelma, won quilting prizes for her tiny, perfect stitches and beautiful patterns. She might have sewn my green patchwork in the found slivers of evening between when the farm chores were done and it was time to go to bed and fall asleep thanking God for His many blessings. Certainly the quilt was made by a woman who knew better than to waste any small thing that came her way: a scrap of fabric, an opportunity, a precious life. Certainly its stories were laid one alongside the other and stitched with care by one of these Scots/English/Irish matriarchs whose hands tended others while their hearts surely longed for something beautiful and gracious, a part of themselves to leave behind. Somehow, given next to nothing, using life’s cast-offs, they did both of these things and more. The story of their lives – and mine – is tucked between the green backing and patterned top created for posterity stitch by careful stitch. That night, of course, I could not conceive these connections. While my mother fed my sister dinner and gave her a bath, I only felt the quilt’s layers and my aching grief. Wrapped inside both, I cried silently. So my sister would not be afraid? So my mother would not know the depth of my shame? Finally, I slept. The author's mother (left) with her great Aunt Nona, the likely quiltmaker, 1936. She has refined her story now, forty years after the fact. Told so many times, it has become de facto history – children ripped like seedlings from the fertile soil of a home she once tried, and failed, to make. Her remorse remains: things might have been different. But are they ever? I wonder. Or are we merely to make the best of what we’re given? It seems to me now that she woke me late that night, after she read to my sister, tucked her in, and rubbed her back until she slept. Then she rubbed mine until I woke. When I stirred, she began quietly, tentatively. Words are slippery things, like memories; they can be misinterpreted, or reshaped by time to make sense of the inconceivable or create meaning from chaos. Maybe things did not happen this way at all. Still, I remember the bluff and the quilt and the words in a single frame of place and time. She turned my head gently to make me look at her. My mother has never returned pain for pain or hate for hate; instead, she chose to cling to her daughter’s flung knives of hate and despair and to nurture them over the years into luminous pearls that will, in the end, be my finest inheritance. "You kids," she began, "when I left your father. It was like…"
Tears spilled down my warm cheeks as she struggled to verbalize the words I had read in her eyes earlier that evening. In the story that followed, and a thousand since, I have reimagined myself making my way home that dark night. As she spoke, my mother recused me from a life of bitterness by saying I had done nothing wrong to deserve the pain I felt. If her children dangled by roots, it was she who held us. I am with you she seemed to say. You are in my hand. As she talked I saw myself less and less as a cast-off child fighting her way alone up a cold bluff grit-by-dangling root, and more and more as the woman I would become, tucked tightly in the quilt and lifted up by the hands of the women who crafted it. Those whose blood runs through me and whose stories I carry in the way of my mother, and hers before, someplace deep inside. Anne Visser Ney grew up at the edge of coal-mining country in eastern Ohio. She is currently working on a literary memoir about her years of U.S. Coast Guard sea service; her essay, "Middle Passage, Morning Watch" will be anthologized in Red, White, and True (University of Nebraska/Potomac, Spring 2014). Her work has also appeared in print and electronic venues, including Rosebud Literary, Cezanne's Carrot, The Eckerd Review, and the Tampa Bay (formerly St. Petersburg) Times. She is a fourth-term MFA student at the Vermont College of Fine Arts.